Pruning Your Wallet: When Is It a Good Idea to Cancel a Credit Card? Spring is here, and you’re probably thinking about pruning your garden for the new season. After all, you’ll need to get rid of the weeds to make room for flowers. The same goes for your wallet: Occasionally, you might want to sort through your credit cards and get rid of plastic you’re not using. But is it a good idea to cancel a card? And how should you decide which to ditch? Let’s dig into the details. Is canceling a card dangerous? It’s common for financial experts to recommend against canceling a credit card. This is because doing so could temporarily hurt your credit score. 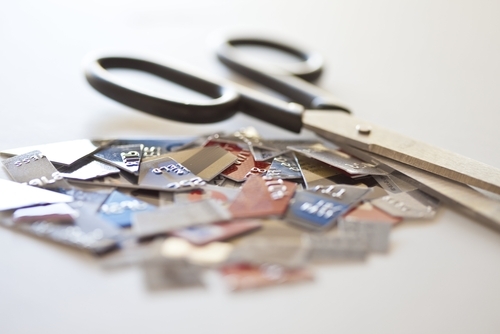 For one thing, canceling a card could increase your credit utilization ratio. Let’s say you have two credit cards, one with a $5,000 limit on which you owe $1,500 and another with a $1,000 limit on which you owe nothing. In this scenario, you’re using 25% of your available credit. But if you cancel the card with the $1,000 limit, your credit-in-use will shoot up to 30%. You’ve now hit a utilization ratio that credit bureaus view unfavorably, and your credit could take a hit. The ding might be substantial; 30% of your credit score comes from your debt load, and credit utilization fits into this category. Another consideration is the length of time you’ve had the card open. Closing a credit card you’ve had for years could impact your score down the line. Contrary to popular belief, a credit account with positive information won’t drop off your credit report immediately; this takes about 10 years. But the credit bureaus like to see a long history of responsible credit use – by canceling an old card, you could be setting yourself up for a ding when the account no longer appears on your history. Given the credit score implications noted above, you might think that it’s never a good idea to cancel a card. While it’s never going to help your score to get rid of plastic, the hit will be minor if you cancel carefully (more on that in a minute). Plus, it will bounce back in time if you keep up with good credit habits. You’re not using the card and it charges an annual fee – Paying an annual fee is only worthwhile if you’re racking up enough rewards to outweigh it. Nerd note: Check with your issuer to see if you’re able to downgrade to a different version of the card that doesn’t charge an annual fee. This is a better option than canceling altogether. You haven’t had the card open for a long time – If you dislike a card and you haven’t had it open for very long, closing it won’t affect your credit much. You don’t have a high credit limit on the card – Again, if you don’t like one of your cards and the credit limit isn’t high, it’s probably safe to get rid of it. Doing so probably won’t impact your percentage of credit-in-use very much. Just be sure that canceling the card won’t push you above the 30% utilization threshold. You can’t control your spending with the card – Credit card debt is costly, so if you’re constantly charging too much, it might be best to remove the temptation. Find out what will happen to your rewards. Canceling a card could mean giving up any unused points, miles, or cash back. If this is the case, use up your rewards before ditching the card. Pay off the balance. It’s tough to cancel an account that you still owe money on; settling the charges first will make things move faster. Contact your card’s customer service center. Let them know that you need to cancel the card and follow the steps they suggest. This might entail using an online tool or putting your request in writing, so be sure to pay careful attention and follow up if necessary. Monitor your credit. Check your credit report in a few months to be sure that your account has been closed. Wait to cancel other cards. If you want to get rid of other cards, hold off for a few months. This will give your credit score time to recover. The bottom line: Although your credit score could take a minor hit from canceling a card, sometimes doing so makes sense. Just be sure to think carefully before canceling and follow our tips to make the process smooth.